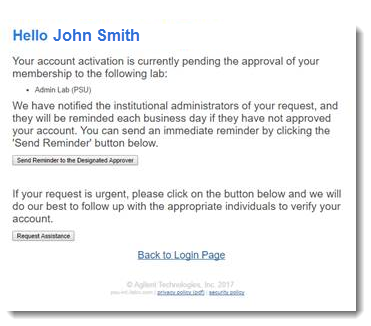 As a Penn State user with a Penn State access account you will be able to use your existing Penn State Web Access single sign on login to use the iLab system. 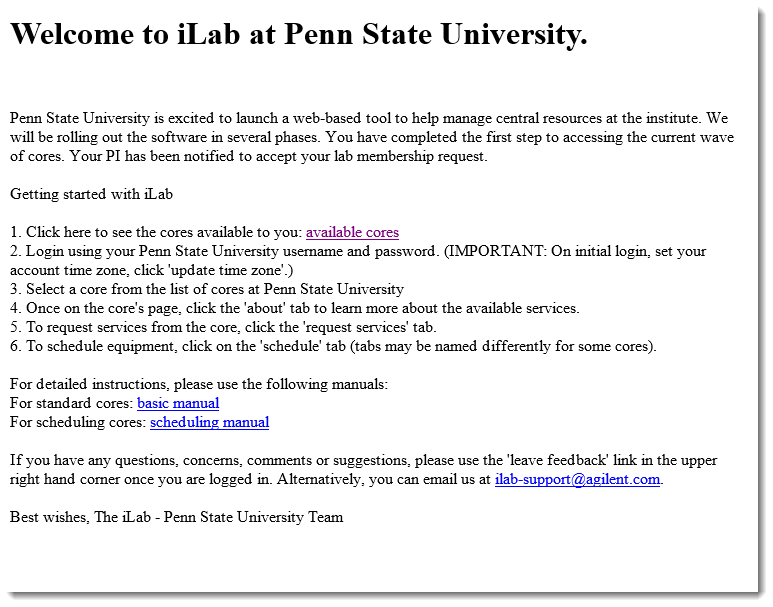 In a browser, navigate to the Penn State iLab website. **Please bookmark this site for future reference. ** Click the login button in the upper right corner of the page. Under the Penn State user (with Access ID) heading, click the link labeled “here” to continue. If you have not yet logged into Penn State’s Web Access, log into Penn State using your Web Access account credentials. Complete the iLab Account Registration form. NOTE: PIs listed as primary on funds in IBIS will have accounts automatically created. In this case the registration process will simplified. Select a PI/Group from the drop down list. For PIs, select yourself. If you are not listed in the drop down list, please submit a PI/Group Creation Request using the iLab Help Request Form. 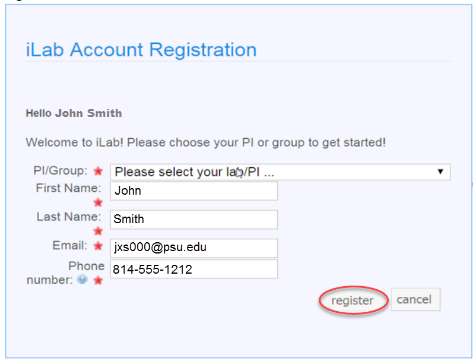 If your PI is NOT in the drop down list, please select the PSU NEW USER (PSU) Lab as your PI. Your PI will need to create their account and add you to their lab. PLEASE DISCUSS THIS WITH YOUR PI. NOTE: You will not have access to funds as a member of the PSU NEW USER (PSU) Lab until your PI adds you to their lab and grants you access to their funds. You will NOT be accepted into the PSU NEW USER (PSU) Lab. This step is provided to allow you to complete the registration/account creation process. Fill in your First Name. This should be populated for you. Fill in your Last Name. This should be populated for you. Fill in your Penn State Email Address (xxx123@psu.edu) Do not use an alias. This should be populated for you. Select the register button to register for your account. Once your account has been created, you will receive an email indicating that your account is pending approval. In this step you are waiting for the PI to accept your request to join their lab. If your account request is urgent, please select the Request Assistance button in the email. If your account is taking longer than 48 hours to be approved, please select the Send Reminder to the Designated Approver button. You may want to contact your PI directly to let them know that you have submitted your request for their approval. They will need to approve your account request within iLab and assign you a valid fund number to use. You may additionally be approved for iLab access by the Institutional Administrator, but your PI is still responsible for assigning funds for you to use. You will not be able to reserve equipment or request services until your PI has assigned funds to you for use. When your account is approved, you will receive an email that provides basic information to get you started with iLab. It provides a link to a list of Penn State cores available for use, a link to a basic iLab user manual, a link to a basic scheduling manual. 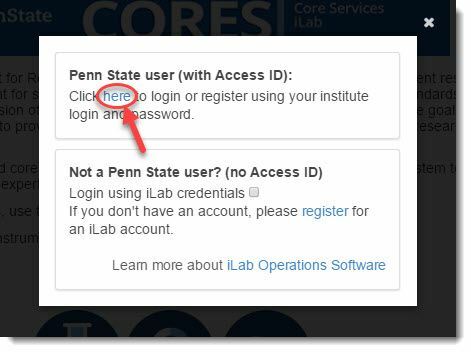 You are now able to log into iLab at https://psu.corefacilities.org and use the Penn State Research Cores that are implemented in iLab. Please see the Agilent iLab Help Page for Registering with iLab for additional information.